The Old Dairy in Combwich, near Bridgwater sleeps 2 people. The Old Dairy near Bridgwater has a private indoor swimming pool and hot tub. Tucked away behind the owners’ home, this cosy cottage has its own private indoor pool and hot tub. Behind the swimming pool, there is a private courtyard area with table and chairs, ideal for dining al fresco, and a small summerhouse. There is a large lawned garden which is shared with the owner. The Old Dairy near Bridgwater has been decorated and furnished to a very good standard, and there is a small living area with wood burner, ideal for all year round holidays, and a large bedroom with TV. Bridgwater Carnival takes place on the nearest Saturday to Bonfire Night, and makes a fabulous night out. There are many National Trust properties close by including Dunster Castle and Gardens. Taunton is ideal for shopping with many local shops, cafés and restaurants. Minehead is worth a visit with its lovely beaches. Take a trip on the West Somerset Steam Railway from Minehead to the pretty harbour town of Watchet. Also worth a visit are Porlock and Porlock Weir close by. There are so many places to visit one week is never enough. The beach is 2 miles. With the shop 100 yards, and the pub & restaurant 500 yards from The Old Dairy near Bridgwater. Oil central heating, electricity, bed linen and towels included. Initial logs for wood burner included. Welcome pack. Use of washing machine. Courtyard with sitting-out area and garden furniture. Shared 1-acre grounds and garden. Summerhouse. 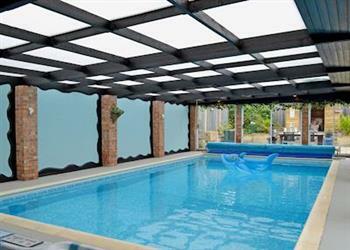 Indoor heated swimming pool (9.1m x 4.5m, depth 1m - 1.5m) with changing facilities. Hot tub. Private parking for 1 car. No smoking. Holidays at The Old Dairy run from Friday to Friday. For a better idea of where The Old Dairy is, you can see The Old Dairy on the map below. The Old Dairy is in Somerset; should you be on the lookout for a special offer, you can find all the special offers in Somerset. It's always worth checking to see what is on offer at the moment. Do you want to holiday near The Old Dairy (UKC527), you can see other cottages within 25 miles of The Old Dairy; have a look to find your perfect holiday location.